Use the form below to inquire about Traditional Style Homestay At Chellangode . Use the form below to reserve for Traditional Style Homestay At Chellangode . Ceiling Fan, Hot and Cold Running Water, TV with cable connection in each rooms. On the other side of swirling roads, cutting through the glorious mountain ranges of the Western Ghats is a piece of enchanting God’s Own Country—the mist clad stunning Wayanad. Across its sprawling spice plantations, perfectly trimmed tea estates, rivulets, and waterfalls, this traditional style Homestay at Chellangode await the arrival of weary travelers seeking moments of serenity. This Homestay promises a memorable experience. The 20 acres of spice plantations encompassing the traditional Homestay fill the pristine air with the aroma of raw nature and exotic spices. 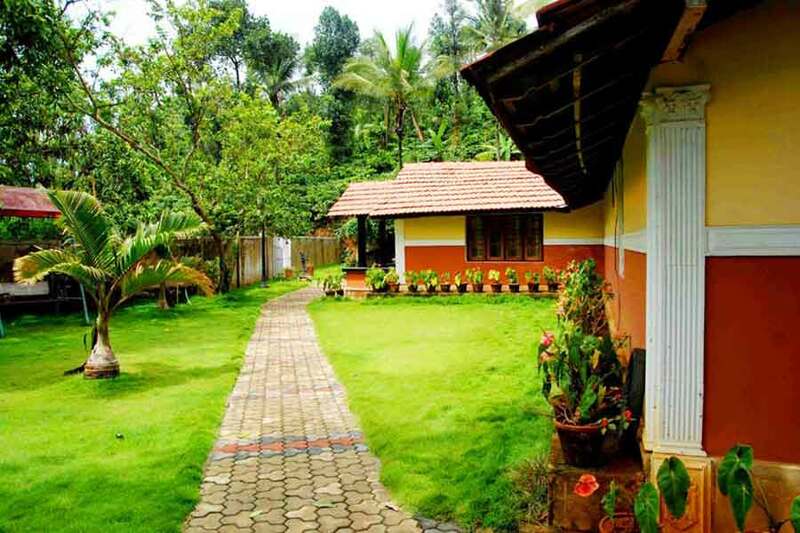 This 55-year- old heritage bungalow is a mere 2.5 km away from the roaring Meenmutty waterfalls. All four rooms in this Homestay at Chellangode in Wayanad provide guests with spectacular views of the coffee plantations. The interiors have a warm décor while the wooden ceiling makes it a cozy nest perfect for nuzzling in the chilly weather typical of the terrain. The hues of the flooring and other furnishings accentuate this coziness. King size beds, en suite bathrooms and LCD TV with cable adds to the experience. The entire bungalow can be booked for functions. The charm of the immaculately kept lush lawn and colorful garden set against the spice estate and coffee plantation plays the perfect backdrop for any event. Amenities such as a multi cuisine restaurant, coffee shop, swimming pool, cycles, library, indoor and outdoor games, kids’ park, bird watching, and guide service can be arranged at an extra cost. Lip-smacking vegetarian and non-vegetarian local Kerala delicacies prepared from home-grown vegetables are served. If your taste buds desire more scintillation, head to the restaurant at the resort. Short nature treks, guided tours through the tea estate, Laundry service, doctor on call, taxi service, and travel desk are services you can count on. Campfire, tribal dance performances, and many Kerala art forms can be arranged on request to enchant your evening. Activities and meals as per package chosen. Charges/Activities not mentioned in inclusion are chargeable. Summer rates are from 01 April 2016 – 30 September 2016. Winter rates from 01 October 2016 – 31 March 2017. Check-in time is 12.00 noon and check-out time is 10.00 am. Please guarantee your reservation against cash deposit, service voucher, or demand draft at the time of booking. A guaranteed reservation will be held until 2000 hrs unless a late arrival is specified. Please intimate us the exact address to which the bills are to be sent or else bills will be sent to the address on the voucher. Rooms may be released if payments/vouchers are not issued within cut-off periods. In the unlikely event of our inability to accommodate you despite your holding a guaranteed reservation, we will arrange alternate accommodation and transport you at our cost. Children below 6 years stay complimentary. 6-12 years will be treated as a child and will be charged as per rates/package guidelines. Children above 12 years will be treated as adults. 0 -10 days prior to stay - no refund. 11-20 days prior to stay - 50% refund. 21 -30 days prior to stay - 75% refund. More than 30 days prior to stay- full refund. In the case of a no - show or cancellation of a guaranteed reservation the hotel reserves the right to levy retention charges for the entire stay. On prior requests, local tribal dances, Kalaripayattu, and many Kerala art forms can be arranged to be displayed to add colour to your evening here. Campfire evenings are the quintessential part of a resort experience after twilight. Gather together with family and friends around its warmth for a memorable bonding session. Travel on NH766 till Chundale. After crossing Chundale, drive on SH 29 till you reach Vaduvanchal, crossing places like Meppadi and Podivayal. This Homestay is located at Vaduvanchal, near the Tamil Nadu border. The rooms are simple yet elegantly furnished. The cuisine is local Kerala delicacies with a vegetarian as well as non-vegetarian spread.